Who Will Be the First Publisher to Announce a Comic Adaptation of John Oliver's Johnny Abracadabra? Home » Comics » Who Will Be the First Publisher to Announce a Comic Adaptation of John Oliver’s Johnny Abracadabra? Who Will Be the First Publisher to Announce a Comic Adaptation of John Oliver’s Johnny Abracadabra? 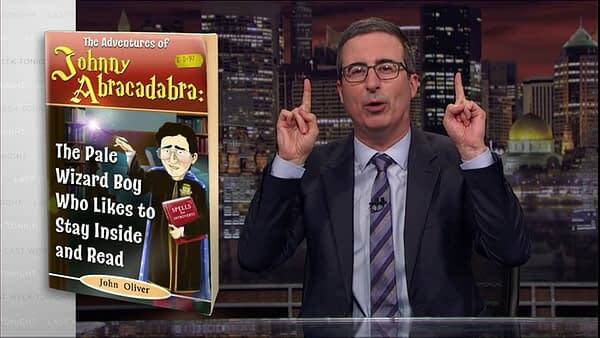 In last night’s Last Week Tonight with John Oliver on HBO, John Oliver mock-announced his new novel series Johnny Abracadabra. Beginning with The Pale Wizard Boy Who Likes To Stay Inside And Read. Now, no such novel has been published, naturally, but when has that stopped someone licensing something like this for a comic book? Oni Press published a number of comic books based on Stephen Colbert‘s non-existing Tek Jansen animated series. And with Diane Nelson failing to secure a Harry Potter comic book from her best mate JK Rowling, could this be the next best thing? After all, Dark Horse Comics are probably looking for their next license, aren’t they?